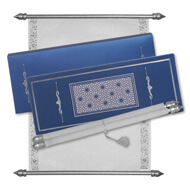 Description: Dark blue scroll box has a matching laser cut pasteup in the centre. Inside the box is a white non woven material scroll with silver borders on the sides and silver rods attached at the ends. The box comes with a matching blue envelope. Size: Scroll :11.5" x 8.5" Box :5" x 12.25"